Robert Cannon refers to his sculpture technique as terraforming, a word used by scientists to describe the process of creating habitable, “earth-like” environments in places like the moon or other planets. Cannon’s terraforms are much more, shall we say, down-to-earth. He builds them, often in the shapes of people, out of hollow shells of ferro-cement, adding pockets of earth and plants in the places where the pieces connect. They look a bit like androids whose spaceship landed in the Garden of Eden. You can see (and buy) more of his work here. 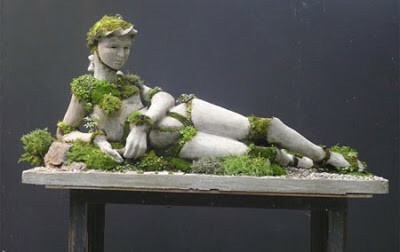 This entry was posted in The Art of Science and tagged plant sculture, Robert Cannon, Science Sculpture, terraforming. Bookmark the permalink.